At some point I have to put a recipe in my blog...right? It's required isn't it? So, let's get it out of the way then. 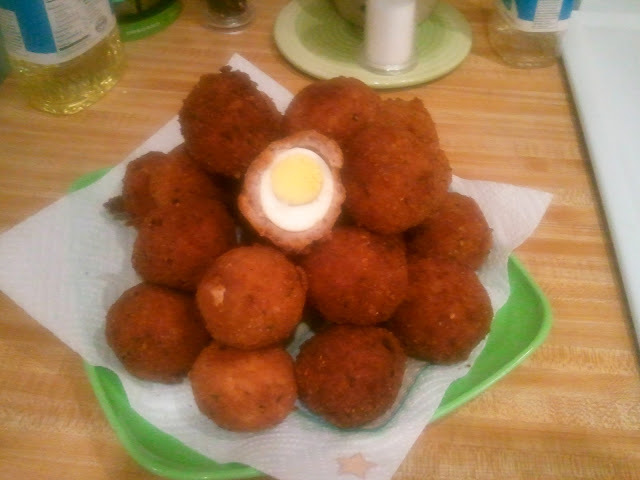 Here's one that's my been my potluck standby over the years - my homemade Scotch Eggs with special sauce. What are they? Scotch Eggs are a British picnic hamper favorite, along with pork pies, Cornish pasties, cress sandwiches and Robinson's lemon squash. (my list of favorites - you can tell me what I missed!). You start with shelled boiled eggs, wrap them in sausage meat, a layer of breadcrumbs and then deep fry until golden brown. I've got my egg wrapping technique down to a fine art and when I'm cooking up a batch, my kitchen is an assembly line as I roll, wrap, dip and dunk, popping out dozens of eggs like some demented cluck. Oh, and the special sauce? HP Brown Sauce...smother those bad boys in it and you'll be saying "Cor, blimey, Mister!" before you've asked fo milk in your tea and a bacon buttie. Paula Deen eat your heart out. Actually, she might as well - a couple of scotch eggs probably have more calories than Jack's Triple Ultimate Cheeseburger with curly fries.